Seen it on FB first, came to the main site, wasnt even updated yet. By the way S4xon nothing wrong with being a little overzealouse we can dream you know. But ok how about we say 50 points for his rookie yr then I for 1 have high hopes for the young fella not to mention grunland I hope he will become a house hold name next yr as well. I think although Feaster did pretty good on a couple of the picks he did in his time with us the jankowski pick was a big mistake for our first round Im sure he was smoking something at that time. Not saying he might not turn out to be ok but at this point I don't see it but at the time we needed help now not 5 yrs from now Just saying. I would love if the kid put up superstar numbers, everyone here would, but the same was thought of Sven when he came up and scored 3 in 5, and now he's in the AHL and fewer people talk about him. Tempering expectations is the way to go, that way if they supercede your expectations, it's that much sweeter, and a load off of the kid. To me he's been the most exciting Flames prospect to follow in a long time. A personal fave of mine, but I'll wait to start the parade until I can see first hand what he can do with 2 full seasons under his belt with the big club. If you remember most likly not but I said bertch was not going to put up those types of numbers way back then I said trade him if I remeber you were not happy with my opnion then I also said I doubt he would play a full season with out getting hurt but saying that I was impressed with his ability to stay out of the nurses station this yr .
By the way Im not saying I have a crystal ball just saying I think Johnny is in a egg of his own and will be as good as st louis was back then as long as they give him his space to grow. not to mention grunland I hope he will become a house hold name next yr as well. I have the chance to watch Johnny 'Hockey' Gaudreau AND Draisaitl!!!!! You lucky duck. Enjoy it, and take pictures. CALGARY, AB -- Johnny Gaudreau kicked off the 2014 IIHF World Championship pre-tournament with a bang, scoring the game-winner for the USA in a 3-1 victory over Germany on Tuesday. Gaudreau scored the Americans second goal just 14 seconds after Tyler Johnson opened the scoring in the first period. Gaudreau's tally, which came at the 5:02 mark, was assisted on by Edmonton Oilers defenceman Jeff Petry and Tim Stapleton, who has spent the last two seasons in the KHL. Johnson scored his second goal and made it 3-0 less than a minute into the second period. The Germans responded with a Sinan Akdag goal 14:41 of the middle stanza but that was all they could muster against the Americans. Gaudreau and the USA open their preliminary-round schedule in the World Championship on Friday against Belarus at 11:45 AM MST. Is there any level that Johnny Hockey can't score? I hope I can PVR the games so that I can see him, Mony, Backs, Hudler, and Baertschi play. JH could very likely play with Hayes again to re-kindle the magic. 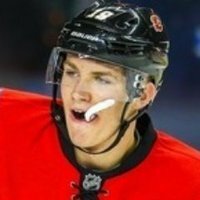 If so, you may see Hayes want to sign in CGY. A bit of a leap, but hey it is Thursday! Gaudreau with 1 goal 2 assists, 17:28 ice time. United States 6, Belarus 1: Jacob Trouba (Winnipeg Jets), Johnny Gaudreau (Calgary Flames) andColin McDonald (New York Islanders) scored even-strength goals in a span of 2:53 late in the second when the United States opened a 4-0 lead in preliminary-round play at Minsk Arena. Trouba scored two goals, and Jake Gardiner (Toronto Maple Leafs) and Brock Nelson (New York Islanders) once for the Americans, who will play Switzerland on Saturday. Gaudreau, who won the Hobey Baker Award as the best player in NCAA Division I hockey, led the United States with three points (one goal, two assists) in 17:28 of ice time. Gaudreau, a 2011 fourth-round pick (No. 104) of the Flames, produced 80 points in 40 games for Boston College in 2013-14 and led the nation in goals (36) and assists (44). He is the first player to have 80 or more points in college hockey since Colorado College's Peter Sejna had 82 in 2002-03. That is one hell of a shot, it doesnt matter what goalie that was on, it was in the exact spot he wanted it and it went in. It was definitely a beauty. Seeing it live was a treat. The faces of his teammates and Lavi on the bench said it all. His moves today....I can't believe this kid. He dekes out Roman Josi, who is a fulltime NHL'er (Nashville Predators), like he's a whl'er. Too bad Berra got just enough to make the save and tip it wide. His moves today....I can't believe this kid. But that was amazing, the moves were so calculated #90 Josi needs a new uniform 'cause he was, to put it blunt, Undressed! The guy managed to draw four players and still got a great scoring chance on his own. Crazy. I was really excited by Gaudreau's potential, happily ignoring the probability I was wildly overrating him. But I just cannot believe the way he is performing against proper grown-up pros. Now I suspect I was underrating him and I really really really hope I'm right. He wanted off the top crossbar carom @ that angle & in rather then aiming an inch lower (lots of room the way the goalie was down on 1 knee)? He's looking really good. Amazing dexterity and balance on his skates. He has a wicked shot and can almost laser beam them where he wants. However, lets temper our excitement just a little. I'd really hate to see JH rushed into a role he's not ready for. Everything indicates he is tracking in the right direction and that's a huge positive for the Flames but IIHF games are nothing like NHL games. Forwards tend to shine on the bigger ice and not a lot of the play is along the boards, lets wait and see how he performs under NHL conditions with next season's training camp and pre season games. This will go a lot further to telling us what kind of player we have in JH. Just like at the Olympics where everything was kept outside and the defense lead the teams in scoring. Fair enough but you have to agree that history has shown us that the bigger ice surface has been beneficial to a faster paced game and less bumping and grinding and puck battles along the boards. I think you're seeing the change now to the more popular NA game where being hard on the forecheck and wearing your opponent down to open up ice is becoming the norm. I suspect in the Russia/USA game we'll see exactly that and we'll get a glimpse how JH plays. Please don't mistake my being cautious with JH as a slight against him. I hope he keeps on doing what he's doing and has all the success in a Flames uniform. I guess I'm still concerned about his size and transitioning from College hockey to the NHL. Is he that special kid that can be like a St. Louis or a Fleury and thrive despite of his size? That remains to be seen. I just don't want to see Flames Fans get their hopes set to high just to see him struggle at first. Look at the way some people think about Baertschi now. One poster on here even suggests trading him for a bag of pucks is a viable option. I don't want to see that happen to Gaudreau. And in the rest of the bolded I'm with you on here, Cautious but excited optimism with a bit of patience but it's still hard to temper expectations which is what I hope is the final outcome when JG is a consistent contributor and is an energetic spark plug we've sorely missed on our team. Luckily and unfortunately at the cost of a longer developmental period for Baertschi I think fans are going to be a bit more cautiously optimistic over JG. Jury's still out on him but only time will tell, I always enjoy a good underdog story if you want to call it that. Agreed, no rush after all!